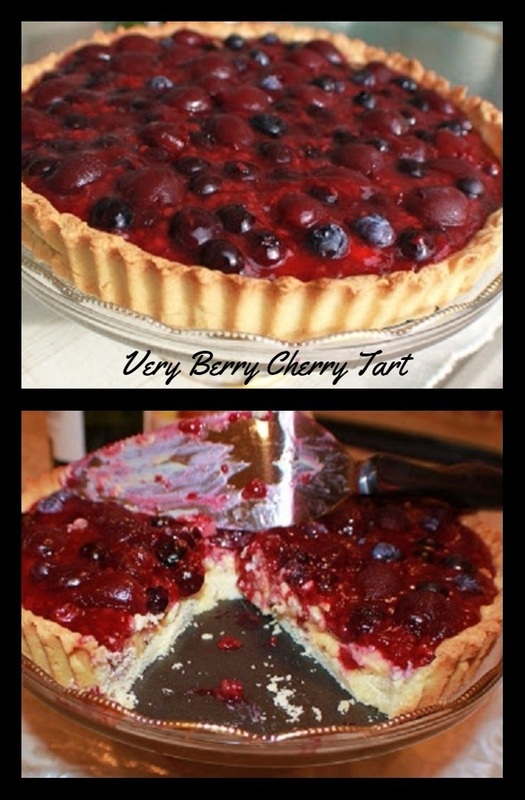 Very Berry Cherry Italian Cream Tart. An elegant dessert to serve, it took me longer to try and get a good picture than it was to make from start to finish! Fruit Suggestions: canned peaches, pears, plums, cherries, raspberries, blackberries, boysenberries, blueberries. Fresh when in season. When Erin from The Queen of Tarts Blog contacted me about my Blueberry Donut post on Foodbuzz, I was so honored to be asked if she can repost using Oregon canned fruits in her post. She offered to send me some samples and I couldn't wait to whip something up with them. Thanks Erin! Mix cornstarch in a small amount of water to make a smooth paste. Pour the drained juice into a small saucepan on medium heat, ( if using all fresh fruit, you can use apple, pear or other fruit juice to make one cup) add the cornstarch and cook till thickened. Takes around 3 to 4 minutes after boiling. Cool. Roll out dough on parchment paper, lift to carefully place in lightly oil sprayed tart pan. Sprinkle with chopped nuts. Prick the bottom of the dough with a fork. Bake until golden or around 30 minutes at 375 degree hot oven. Cool completely. 1 tablespoon almond or vanilla, added last. Blend dry ingredients in a bowl set aside. Add milk slowly beating till smooth whisk in yolks, cook till thickened, remove from heat stir in peel and add vanilla. Cool. Pour the cream filling on the crust, top with fruit of choice. Serve immediately or refrigerate until ready to eat. This looks so good! I never make tarts but have a tart pan that I use to make a lot of homemade quiches in. I may have to pull those out and make this. Yum! That tart looks fantastic! A few nuts on the bottom for a little crunch. mmmm! Looks like a perfect Valentine's Day treat! But I do not have a tart pan! Enough reason to get one! Berries and cream are something that I cannot resist-yum! This definitely looks like you did not skimp on that fruit. I also like the touch of nuts in the bottom of the crust. Your picture does look fabulous, however a dessert that quickly disappears is the real clue to how wonderful it really is. Great recipe Claudia! This looks incredible Claudia! The cherry topping is so luscious. Love it! where is the sugar for the fruit? Is it sweet enough without adding sugar? @Melinda good question. Yes the canned cherries with the addition of the fresh is sweet enough not to add any sugar to our taste. If using all fresh you will have to add around 1/2 cup sugar to 2 cups of fruit... unless you love naturally sweet like we do... most of the time the fruits here in Florida are sweet enough! I really feel red and white is just magical on Valentine's Day - this is so very pretty. I don't know about how long it took to get a good photograph - but you did! It's a welcoming beauty! Wow! This sound delicious and it's absolutely picture perfect! Happy (early) Valentines Day! So yummy! Any tart or pie grabs my attention. Woah! Absolutely perfect! Love the colors! Just gorgeous. So wonderful! Any man should be grateful to get this for their v-day dinner desert! This is simply gorgeous. I want a huge slice of this immediately! I love that you added nuts on top of the crust, what a great texture this would add! Gorgeous tart! This looks so good! I love all berries, I can just imagine how tasty this is, Its beautiful! This looks like a very delicious tart! I have liked it! Thanks for sharing the recipe with us. Oh my gosh this looks positively decadent. This makes me wish I was your neighbour. Oh, this looks so good. It wouldn't last long around me either! This tart looks so good Claudia! Ooh, Claudia, I know you said it was fast but it looks like the product of a lot of hard work. Delicious!